Located in the central Pacific Ocean, the Hawaiian islands, are truly America’s paradise. Honolulu, on Oahu, is home to amazing beauty, big waves on the North Shore, Pearl Harbor and its WWII memorials, and the beautiful crescent beach of Waikiki. 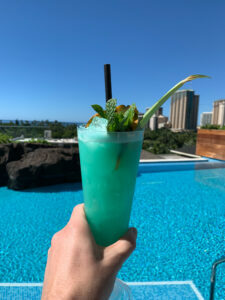 When Ritz-Carlton reached out to see if I wanted to spend a few days experiencing their new Diamond Head Tower at the Ritz-Carlton Residences Waikiki, I jumped at the opportunity. 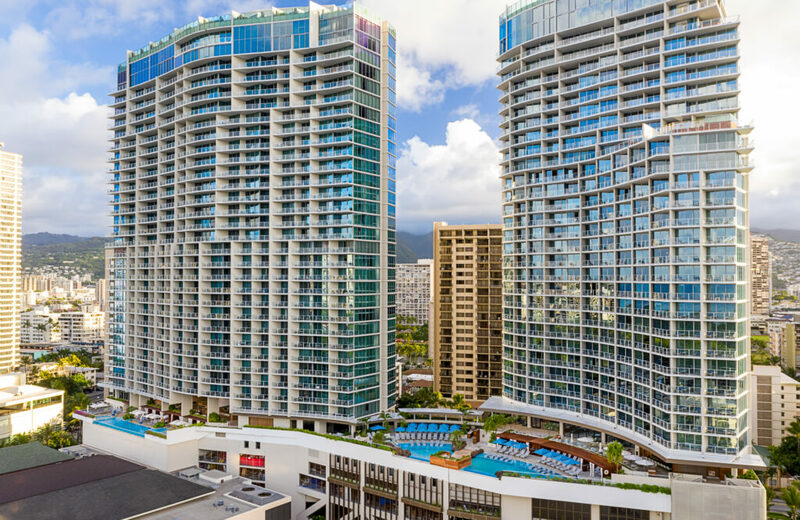 Located on Waikiki’s luxury row, the Ritz-Carlton Residences Waikiki, boasts the most luxury hotel suites – all oceanview – on the island to go along with the highest infinity pool in all of Waikiki. Arriving at the property, guests are whisked to the 8th floor open air lobby to check-in. From here you get an expansive view of the Pacific Ocean and all that awaits during your stay. After saying yes to the welcome drink – with rum please – I was taken to my studio suite. As this is a residence property, all guest rooms are appointed with a kitchen/kitchenette, refrigerator, and washer dryer. It really is designed for a long-term stay. My stay was in a studio which is plenty big for 2 guests. Larger one, two, three, and even four bedroom options are available. 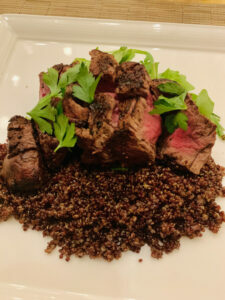 For guests who don’t want to cook in their residences, there are four on-site options for food. The Market is open for breakfast, lunch, and dinner. 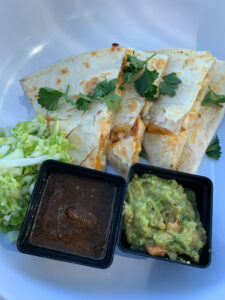 Poolside dining is available with a modified more casual menu than what is available at The Market. Sushi Sho has an impressive sushi counter. It is very small seating and reservations are required. Lastly, on-site is Dean and Deluca for smaller bites throughout the day. 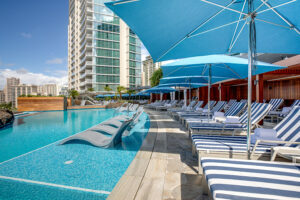 These are also of course in addition to the number of options outside your door along Waikiki Beach. Of course, the “thing” that makes Ritz-Carlton’s well, Ritz-Carlton’s is all of the details. 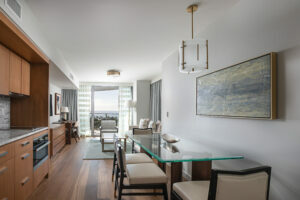 From the beautiful tile floors, well appointed suites, delicious food, the Ritz-Carlton Residences Waikiki meets all of the expectations one would have when staying at a Ritz-Carlton property. Part of the product Ritz-Carlton sells is the experience and that is not more evident than with the staff. Always friendly, available, and ready to cater to your every need – with a smile – is can help make the difference between a good stay and a great stay. 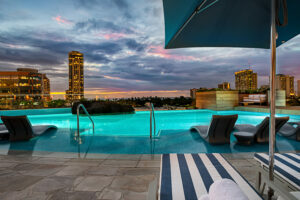 The Ritz-Carlton Residences Waikiki hits the mark on this. 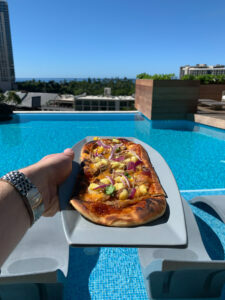 With the highest infinity pool in all of Waikiki (along with a smaller and slightly lower elevation infinity pool), delicious food, and amazing staff it is a wonder one would want to leave the property. 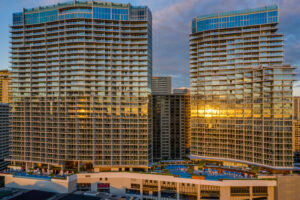 However, a short 5 minute walk from the property and you’ll be on the world famous Waikiki Beach. With beautiful sand, lots of sun, and waves lapping in slowly it is the perfect place to relax and spend a day. There is no better place to learn to surf than Waikiki. The waves are usually pretty consistent, small, and there are lots of options of experienced locals along the beach who will ensure you get up on the board at least once! Oahu is full of activities and historic sites, whether that is to visit the memorials at Pearl Harbor or hiking in the mountains to see waterfalls. A friendly concierge staff can help you with all your activity bookings – as well as off-site restaurant reservations. They have lots of local knowledge so I recommend spending some time chatting with them to ensure you get the most out of your stay. 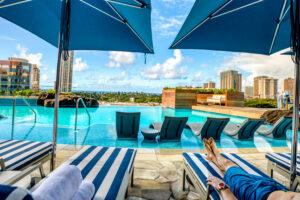 The Ritz-Carlton Residences Waikiki combine the perfect mix of the luxury you’d expect at a Ritz-Carlton hotel with the perks of an extended stay apartment. This makes the property the best option for those looking to spend time on Oahu exploring all the island has to offer. 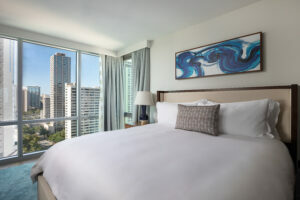 Guests can spend a few days each exploring the mountains and North Shore, seeing all of the historic sites around Pearl Harbor, relaxing and surfing on Waikiki Beach, and lounging by the pool on-site. Before you know it your week (or two) is up and you’ll be itching to book a return visit to do it all again.